I went with a friend recently to shoot some senior photos at this amazing farm. The place had THE MOST amazing scenery, including beautiful waterfalls (yes, multiple). Since we were there anyway I decided to take advantage of such a gorgeous location! Also, I'm the newest beauty contributor over on A Beautiful Mess and there is a fun hair tutorial up. Be sure to take a look if you get a chance. :) Happy Wednesday, friends!! 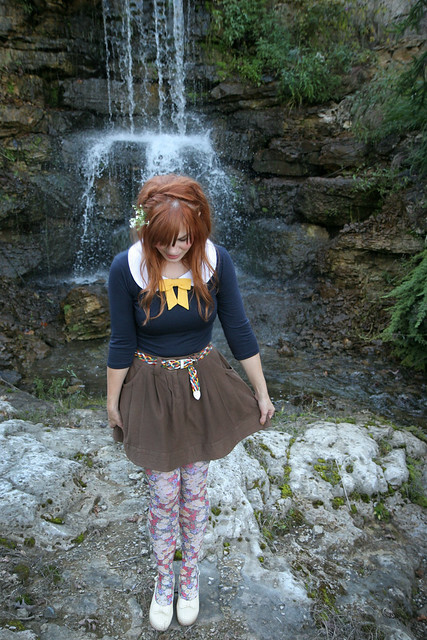 I love how you match all the different colours together- yellow ribbon, rainbow colour belt, floral tights. Everything looks so good together! Excellent hair in this photo, too! I love your top, as well - is that a Red Velvet creation? Wow such a pretty place for pictures :) you look gorgeous! I almost got this shirt the other day..now I definitely need to! Immediately thought of TLC when I read the title of this post. Love your outfit-- I need that shirt! That shirt is absolutely amazing. Not to mention the scenery is just gorgeous! cute top! and so jealous of the beautiful location... i want to go! I love that top + shoes!! you have the best style darling!! always love your outfits katie! that shirt & skirt is too cute! the waterfall makes the perfect background. :) love that belt! I think I say this on the daily. But you are a doll!!!!! So dang cute...your tights are making me blush they are so perfect!!! Oh my, I LOVE your haircolor SO much!!! I want to dye my hair that color, but I don't know if I dare.. Or if it will look good on me. Is it your natural color? Love from Mona from Norway. PS. I absolutely LOVE your blog too! You look lovely! I'm not sure if I like the shirt or the tights more. It's all so cute. :] And I loved your post on ABM, I'm excited to try it! Im sure it was a lovely day. katie, your hair bow post was smashing! thrilled with your outfit post. I am totally in love with that top! I want it in my closet now! I just bought flowery tights... now it's time to see if I have the guts to wear them. I really love those shoes! Where would I be able to get some pretty shoes like that? This is outfit is adorable. And I love the location. So fun.x. You always have the most incredible pan collars! 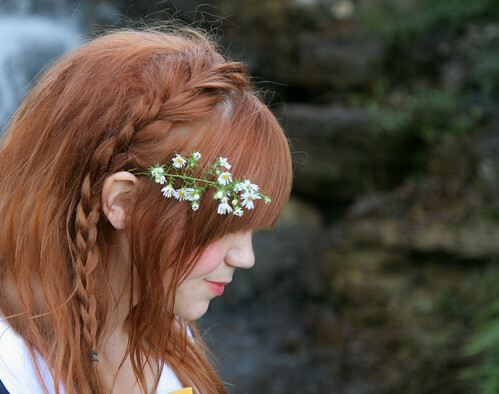 <3 I love love love the flower in your hair too! How did you do your hair like that?! I love it! You're beautiful and I love your blog. The shoes are what caught my attention for sure! I was so hoping you would have a hair tut on the braid and can't wait to apply the method. My daughter is 6 and we both have longish hair so we can't wait to wake up and give it a try. Tomorrow is Saturday so we shall have more time to devote to this new do. Thanks! And your outfits <3 <3 <3 your style is sooo beautiful! Oh my, I LOVE your hair bow SO much!!! I want to dye my hair that color, but I don't know if I dare.. Or if it will look good on me. Is it your natural color?